I grew up in Kew Gardens from 1945 to the late 60's in the Barcelona, 83-09 Lefferts Blvd. I'm now back in Kew Gardens and would love to hear from classmates from P.S. 99, Russell Sage, or RHHS. I lived in Kew Gardens for many years now living in Lambertville NJ on the Delaware in a 157 year old row house. I love it hear but still enjoy going back to Kew Gardens. 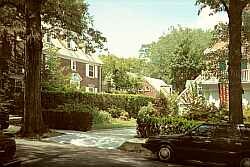 I lived one time in the Forest Hills Inn thks for the great site. I have only lived in Kew Gardens for 9 years, I reside in the most beautiful building in the area-The Beverly House and love the convenience of the area. Really enjoyed your site, learned alot about my former home. My husband and I worked at Regents Row for many years, and lived on Austin St. (son Peter still lives there, rent controlled). We now reside on the West coast of Florida, but always will remember Kew Gardens!!!!!!!! A simply fabulous site for those that had the opportunity to grow up in Kew Gardens, especially in the 1960s and early 1970s. Ah, the memories of P.S. 99, the schoolyard, and Forest Park as we all came of age in a small community in the middle of New York City during a tumultuous period ... Continued success with this site and thank you. Wow!! what can I say? What a great web site for those of us that have moved away!!!!!!!! I'd love to hear from anyone from KG!! I'm a long way from home and often feeling nostalgic. Moved to Kew Gardens in 1935. One of your photos of San Jose Apartments was taken in 1938 and that is my 1937 Pontiac parked in front. I still live in Kew 67 years. Have a home on 80th Road. My daughter and son were born here. Went to P.S.99 and Forest Hills H.S. Children are now scattered, one in Tucson AZ and daughter and grandaughter in Woodstock NY. Both Carol Rubinoff family as well as mine worshipped at Kew Gardens Anshe Sholom Jewish Center. Been living in Kew Gardens for over 20 years. This site was great! Really enjoyed it! Good Job! I was born (1938) and lived my whole life in Kew Gardens up until 1987, when I moved to Los Angeles. Both my sons were born there (Mitch Rubinoff and Scott Rubinoff). They now live in Los Angeles too with their families. We all have wonderful memories of growing up in such a great neighborhood. I went to PS 99 and Forest Hills H.S. (Class of 1956). Who said "you can't go back"? I have been back several times and it still feels like home. This site is wonderful and I am so glad I found it. I was born in 1959 at LIJ and lived at 83-43 118th St from birth until 1993. I now live in St. Louis MO but hope to move back east in the not-too-distant future. Cool site. Moved here in 1981 and still live here, on Lefferts Blvd., just south of Metropolitan Ave.
Hi. I just wanted to express how much I enjoyed your site. 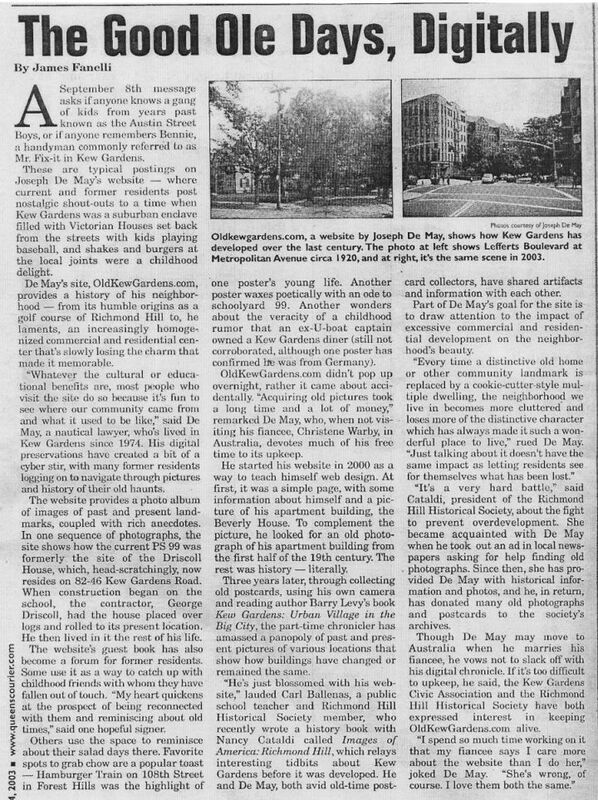 I happen to live in Kew Gardens in the apartment building on the corner of Lefferts and Austin (The Mowbray). I really adore this neighborhood. Thank you for your work. My father & mother had the luncheonette on the corner of Lefferts & Metropolitan from 1941 until 1954. We lived in the Buckingham and after I married, I lived in the apartment house next to the supermarket on Metro. between Lefferts and 118th St. We now live in Lindenhurst. My brother larry and family live in Florida.